Egypt faces two nutritional challenges. The first is the “growth-nutrition disconnect.” High economic growth has not been accompanied by reduction in chronic child malnutrition, at least throughout the 2000s. Instead, the prevalence of child stunting increased during this decade—an atypical trend for a country outside wartime. The second challenge is the simultaneous presence of chronic undernutrition and overnutrition (due to excess consumption of calories). This “double burden of malnutrition” exists not only at the national level but also within families and even individual children. Both challenges are exceptionally pronounced in Egypt compared to other developing countries. 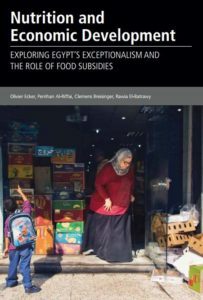 Nutrition and Economic Development: Exploring Egypt’s Exceptionalism and the Role of Food Subsidies examines the two nutritional challenges in depth and their relationship to public policy. The authors examine four key drivers of Egypt’s two nutritional challenges. These, working in combination, are (1) the nutrition transition, (2) economic crises and rising poverty, (3) insufficient nutrition-sensitive investment, and (4) the food subsidy system. Their main hypothesis is that Egypt’s large food subsidy system (as in place until May 2014) has been ineffective in reducing child and maternal undernutrition. In fact, this system may have contributed to sustaining and even aggravating both the double burden of malnutrition and the growth-nutrition disconnect. Reforming this food subsidy system can help to improve nutrition and public health in Egypt. Visit IFPRI Publications page to access various e-formats, download a PDF, or order a free copy of the book. Also see synopsis of the book. The authors gratefully acknowledge financial support from the International Fund for Agricultural Development and the CGIAR Research Program on Policies, Institutions, and Markets.